Superficial dissection of the right side of the neck, showing suprascapular artery. 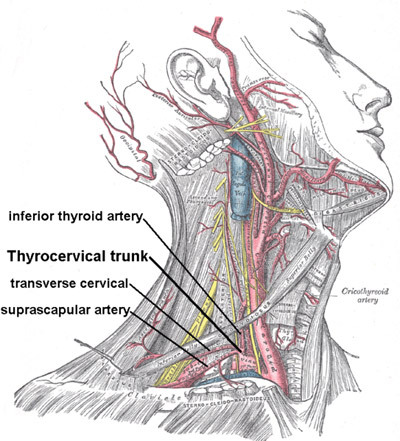 The supracapular artery is one of the two arteries (the other being the transverse cervical artery) that arise, under cover of the sternomastoid, from a short, wide branch of the first part of the subclavian artery, called the thyrocervical trunk, which also gives off the inferior thyroid artery. The suprascapular artery runs laterally and downwards, under cover of the sternomastoid, across the scalenus anterior and the phrenic nerve, and then laterally behind the intermediate third of the clavicle, in front of the subclavian artery, towards the posterior angle of the triangle. There, it joins the suprascapular nerve and decends to the scapula. Behind the clavicle, it is closely accompanied by one or two veins. The main suprascapular and transverse cervical veins end in the external jugular vein.